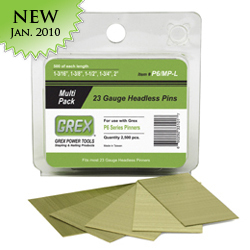 Grex Multi-Pack 23 Gauge Headless Pins are the perfect way to have an assortment of all the most popular pin lengths without having to purchase full packs or boxes of each length. It's ideal for hobbyists and is the perfect starter kit for first-time owners of Grex pinners who just don't quite know what pin lengths they need yet. 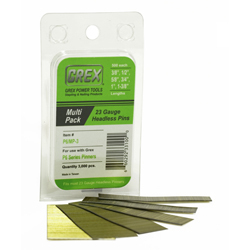 Why choose Grex 23 Gauge Headless Pins? Click here to find out why. 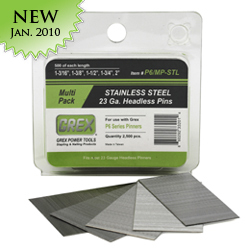 3/8", 1/2", 5/8", 3/4", 1", 1-3/8"
1-3/16", 1-3/8", 1-1/2", 1-3/4", 2"
Why choose Grex 23 Gauge Headless Pins? Not all 23 gauge pins are created equal. The quality of fasteners is dependent on three key attributes: (1) accurate dimensional specifications, (2) optimal material composition, and (3) dependable collation. Because 23 gauge pins are extremely fine, setting high standards for each of these attributes is much more critical than traditional finish nails such as 18 or 16 gauge brads. You can be assured that all Grex 23 Gauge Pins are manufactured and tested for the tightest tolerances for each of these attributes. These qualities will minimize the potential for nail jams and prevent damage to your tool. They also make it possible for your tool to drive these pins into the wood of your choice. 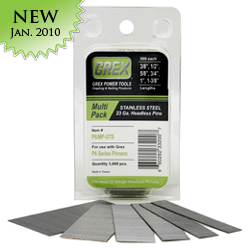 Grex pins can easily penetrate through red oak - that's any pin length ranging from 3/8" upto 2". We have proven results for these pins with Grex Pinners, but they will surely make any 23 gauge pin nailer work better.